Notes: Yeah, that’s clearly an anchovy and not a sardine, isn’t it? I didn’t actually, oh, look at the list until I sat down to write this entry. That being said, before trying this, I’d never actually eaten an anchovy before. It was… pretty good. They smelled like Lynn Beach in August, but they tasted considerably better. Salty, chewy, a little fishy — not bad. And, to the amazement of my husband and I both: the kid ate an anchovy. The whole thing. And said it was “really good.” Go figure. Rating: I need a do-over on this one. I like to fry up a tin of anchovies with tons of garlic , add pasta, grated cheese and pepper flakes. Stinks up the apartment but it’s awesome. Eating anchovies straight? You’re a better man than I am, Gunga Din. 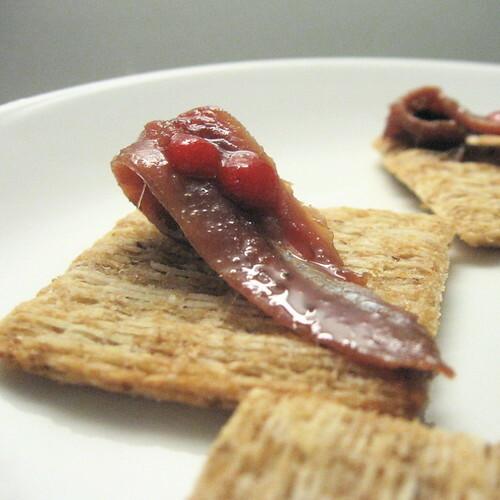 Pingback: #74 (sort of): anchovy on a Triscuit on Flickr - Photo Sharing! Inspired by your entry, I bought a tin of sardines yesterday. This, I think, falls into the “appetizer, not a meal” category with shrimp cocktail, though. In college, my roommate’s parents used to send care packages from Spain that included anchovies, and I really liked them then but haven’t really eaten them since. You have just summed up a dish including my 3 favorite food groups. This one deserves the honor of an Iron Chef award!